Hipster nootropic geeks may not dig the Alpha BRAIN Instant vs. Mind Lab Pro comparison, due to the mainstream popularity of these supplements. And I get that: if you search the subreddit /r/Nootropics, you’ll find plenty of redditors opting for a more self-made DIY approach to stacking nootropics — as opposed to buying manufactured noot stacks. Even so, some premade nootropic stacks are still pretty damn good, and I’d put both Alpha BRAIN Instant and Mind Lab Pro in that “pretty damn good” category. In fact, they’re really good for daily brain health enhancement, the type geared towards cognitive longevity rather than I-need-it-right-now!! unhealthy mental stimulation. However, what you likely want to know is: which one of these supplements is really gooder than the other? Between these uber-popular stacks, which works better? Well, let’s read the Alpha BRAIN Instant vs. Mind Lab Pro comparison review to find out. Alpha BRAIN Instant or Mind Lab Pro: Which is better? Alpha BRAIN Instant comes in liquid powder mixes. Mind Lab Pro comes in clean, green Plantcaps® capsules. Alpha BRAIN Instant Directions:Adults, as a dietary supplement, take one packet mixed with 8 ounces of cold water, preferably with a light meal. Do not take more than one packet in any 24-hour period. L-Theanine – promotes alpha brainwave frequencies. Oat Straw Extract – might also promote alpha waves. Alpha GPC – it has “alpha” in its name! Why would you want to promote alpha brainwaves? Essentially, alpha brainwaves have been associated with meditative, free-flow thinking. Sort of like being “in the zone” where you’re not so amped up that your mind’s all over the place but your focused enough on the task at hand. Ingredients that enhance alpha brainwaves seem to promote creative, “watery,” free associative thinking; great for the ambitious creative. Not only that but Alpha BRAIN Instant’s liquid powder mix format gives this supplement a literal “watery” feel. 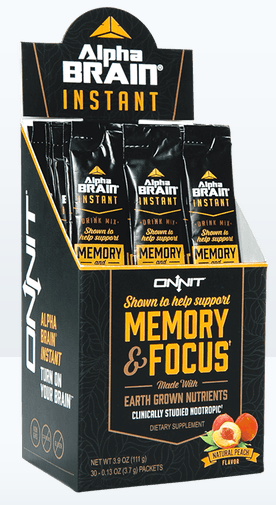 Alpha BRAIN Instant supplies other types of cognitive enhancers, including the Onnit original ac-11® Cat’s Claw extract and pterostilbene for antioxidant neuroprotection. 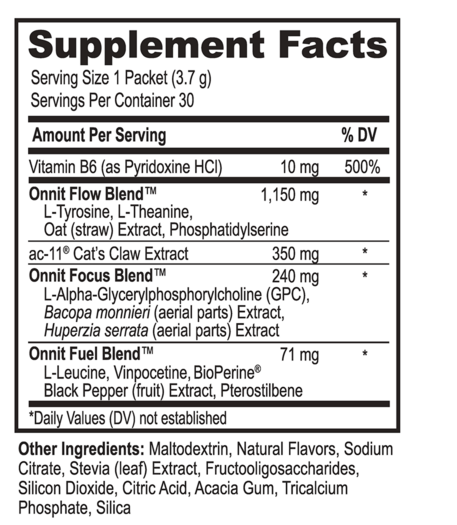 However, for most ingredients (all of them except vitamin B6 and ac-11®), Onnit obscures their individual ingredient dosages by stashing them away in proprietary blends. Hard to tell how effective this stack is without knowing how much of each nootropic is contained in those packets. Read my in-depth review on Alpha BRAIN Instant. Doesn’t resort to cheap synthetic stimulants. Alpha BRAIN successfully made a name for itself by delivering brain boosts without caffeine or other stimulants, and Mind Lab Pro accomplishes the same; however, MLP does so in a cleaner, more transparent fashion. Mind Lab Pro doesn’t use any proprietary blends, showcasing all of its ingredient dosages. And Mind Lab Pro uses clean, green, junk-free Plantcaps® capsules. Admittedly, it’s not as a fun a formula design as Alpha BRAIN Instant’s flavored powdered mixes. However, with a minimum amount of additives under MLP’s “Other Ingredients,” there’s virtually nothing getting between you and Mind Lab Pro’s ingredients. And when the ingredients hit, you may expect them to improve various measures of cognitive performance, including mood, motivation, energy, clarity, and longevity. Great for daily and long-term mental performance. ac-11® Cat’s Claw Extract – Only Onnit supplies this patented extract of Cat’s Claw, an antioxidant, anti-inflammatory herb with significant neuroprotective promise. Oat Straw Extract – In extract form, oat straw seems to possess acute, temporary boosts on cognitive performance; although, the ingredient doesn’t seem to enhance long-term cognition. More on Oat Straw. Alpha-GPC – Mind Lab Pro supplies citicoline. Alpha BRAIN Instant supplies alpha-GPC, a choline-rich nootropic that may enhance the brain’s acetylcholine levels for better memory and learning. More on Alpha-GPC. Huperzine-A – This semi-synthetic compound pairs well with alpha-GPC, due to its potential to inhibit acetylcholinesterase, the enzyme responsible for acetylcholine breakdown. More on Huperzine-A. Vinpocetine – Another semi-synthetic compound, believed to enhance cerebral circulation for better oxygen and nutrient delivery to the brain. More on Vinpocetine. Pterostilbene – As a more potent form of resveratrol, pterostilbene possesses significant antioxidant potential, reducing oxidative stress across the brain and body. More on Pterostilbene. BioPerine® Black Pepper Extract – Always a good idea to add a little black pepper extract, which seems to enhance nutrient absorption; thereby improving Alpha BRAIN Instant’s overall bioavailability. B Vitamins (as BioGenesis™) – Alpha BRAIN has B6, Mind Lab Pro has B6, B9, and B12 in premium, patented BioGenesis™ form. More on B Vitamins. Citicoline (as Cognizin®) – Alpha-GPC supplies a higher concentration of choline, whereas citicoline binds choline with cytidine, a precursor to brain boosting uridine. Citicoline is great for brain energy and restoration. More on Citicoline. Lion’s Mane Mushroom – A unique shroomy ingredient that seems to work by enhancing NGF activity, potentially improving brain repair and regeneration. More on Lion’s Mane. Phosphatidylserine (as Sharp-PS®) – Both supplements here supply PS, yet Mind Lab Pro ups it up a notch by supplying the sunflower-derived Sharp-PS version of this awesome nootropic phospholipid. More on Phosphatidylserine. L-Theanine (as Suntheanine®) – Both supplements supply L-theanine, but Mind Lab Pro supplies the premium Suntheanine brand of this anxiolytic bad boy. More on L-Theanine. Rhodiola Rosea Extract – Awesome, powerful, herbal adaptogen for quick stress and fatigue relief. One of my favorite natural nootropics. More on Rhodiola Rosea. Maritime Pine Bark Extract – Sort of a rare ingredient, maritime pine bark extract supplies a rich complex of neuroprotective, neuroregenerative antioxidants. Great for attention and cognitive longevity. Vitamin B6 – ABI has weak pyridoxine HCl; MLP has enhanced BioGenesis™. L-Theanine – ABI has plain form; MLP has patented Suntheanine®. Phosphatidylserine – ABI has plain form; MLP has patented Sharp-PS®. Bacopa Monnieri – ABI has undeclared extract; MLP has full spectrum extract. And that only covers the ingredients shared between these two products. 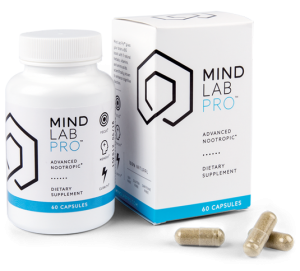 Even so, Mind Lab Pro showcases not only exceptional ingredient quality but quantity as well, whereas Alpha BRAIN Instant fails to showcase the full quality (e.g., extract contents) and quantity (ingredient dosages) of its formula. Alpha BRAIN Instant may have solid ingredient choices, yet they drop the ball when it comes to potency and quality. Mind Lab Pro gets only high marks in this category. As compared to the original Alpha BRAIN (capsules) product, Alpha BRAIN Instant not only supplies more of its ingredients but supplies more servings for a cheaper price per serving. I’ve yet to figure out why Alpha BRAIN would be chosen over Alpha BRAIN Instant, but this much seems to be clear: Alpha BRAIN Instant is the cheaper, better option over Alpha BRAIN. Bottle to bottle, Alpha BRAIN Instant is cheaper than Mind Lab Pro. If you select the Subscribe & Save option for Alpha BRAIN Instant, the price cheapens by 15%. 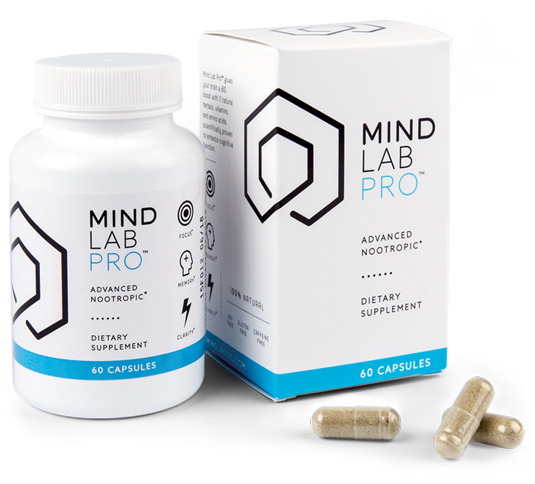 However, if you buy 3-bottle (+1 free) orders of Mind Lab Pro, the price significantly lowers; this seems the best way to go, if you plan on supplementing Mind Lab Pro daily for the long run. Alpha BRAIN Instant is the enhanced version of the original Alpha BRAIN. In my Alpha BRAIN vs. Alpha BRAIN Instant side-by-side comparison, Alpha BRAIN Instant clearly comes out on top, thanks to the product’s increase in ingredient dosages and affordability. (Not to mention the supplement’s tasty switch to liquid powder.) However, in comparison to Mind Lab Pro, there’s not much that this supplement does that Mind Lab Pro doesn’t do. Really, Mind Lab Pro does what Alpha BRAIN Instant does, except better. Mind Lab Pro supplies high quality noots for a wide spectrum of brain benefits. Not only does Mind Lab Pro accomplish Alpha BRAIN Instant’s brain health benefits but this supplement seems to also hit more brain bio-pathways towards enhanced cognition for a more comprehensive nootropic experience. From alpha brainwave free-flow thinking to brain boosting cholinergics to even NGF-boosting brain building, Mind Lab Pro hits an impressive, unique synergy of brain benefits that qualify it as the Universal Nootropic. I view MLP as a solid daily “foundation” stack, great for your everyday long-term brain health boosts. 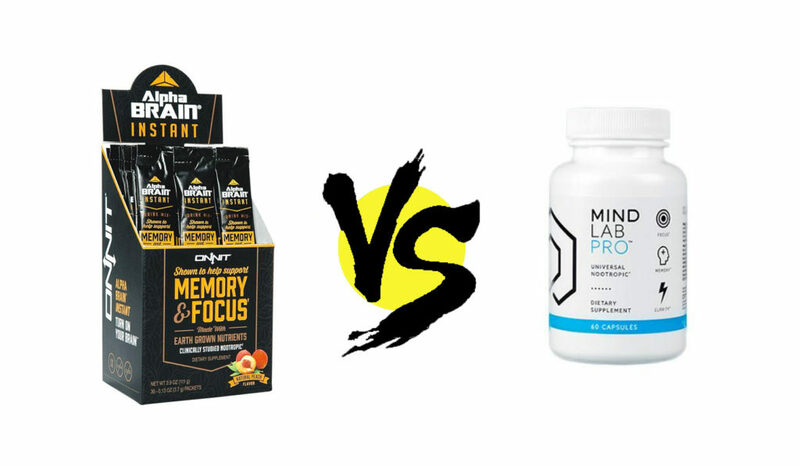 What’s cool about Alpha BRAIN Instant and Mind Lab Pro is that, thanks to their caffeine-free design, you may take either supplement with or without your morning cup of coffee. What’s annoying is when an awesome nootropic supplement stacks up all these awesome nootropics …then crams a sneaky stash of caffeine into the mix. Props to Onnit and Mind Lab Pro for keeping their formulas clean. However, when it comes to clean, natural brain boosts, Mind Lab Pro outperforms Alpha BRAIN Instant with its impressive ingredient quality and unique ingredient choices. 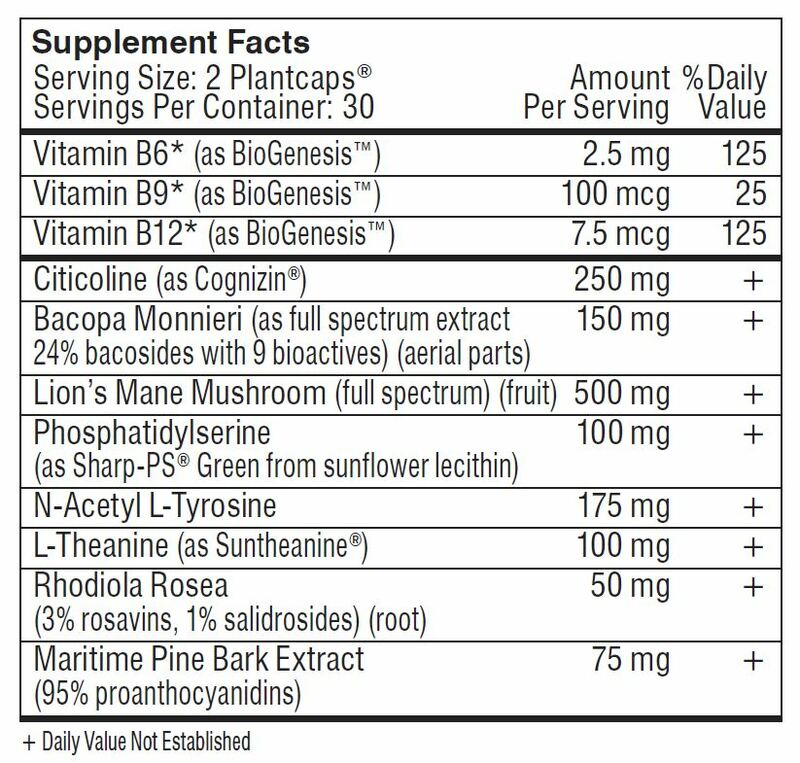 There really isn’t a formula like MLP on the mainstream noot circuit; one that stacks popular nootropic ingredients (e.g., L-theanine, L-tyrosine) with rare brain boosters (e.g., maritime pine bark extract, lion’s mane mushroom). If you’re choosing between Alpha BRAIN and Alpha BRAIN Instant, the answer is easy: Alpha BRAIN Instant. However, in the choice between Alpha BRAIN Instant and Mind Lab Pro, the answer here is also easy: Mind Lab Pro.